After you do a little research, you are going to want to forget shipping containers and use a box culvert bunker instead. If you have looked into building materials for use as a fallout shelter, underground bunker, doomsday bunker, emergency shelter (or whatever else you want to call it), you may have read a lot about using shipping containers to build them out of. Once you have done your research, you’ll have a better understand as to why shipping containers may not be the best option and can be dangerous if you try to bury them. 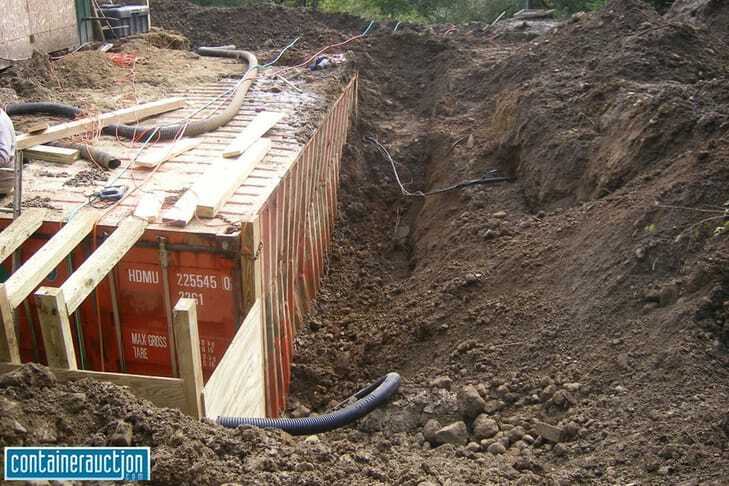 A box culvert bunker may be just what you need instead. If you want to be fully prepared for a disaster – natural or manmade – then you will definitely want to know more about underground bunkers. Knowing how to build or buy your own and how to stock it with supplies is very important. Maybe you’ve heard of people using shipping containers, as we mentioned above. But if you read up on the subject, you’ll see that there are many reasons shipping containers are not a good idea. Instead, let’s discuss why and then we’ll show you an alternative. Let’s start by stating it’s not impossible to build a safe underground bunker using a shipping container. People have definitely done it properly. However, it will take a lot more time and expense than simply buying a shipping container on eBay and tossing it in the back yard. While it’s not advisable to bury a shipping container, the key is reinforcement. Shipping containers were not meant to be stacked on top of each other, with the corners bearing the weight. Earth shifts and moves with regularity, so if you bury an unreinforced shipping container, eventually the sides will buckle under the constant pressure. There is a great series of articles at Container Auction with some pointers on what actions need to be taken if you do end up burying a container. Though they do say you are on your own if you attempt it. As you can see, this shipping container was not reinforced around the outside walls. Once the earth began to shift, the walls started to cave in as is demonstrated in this image. This is especially true when it rains and the earth gets wet and heavy. This is where the box culvert bunker comes into play. The reinforced walls are built right into the structure. You can use box culverts for your bunker or fallout shelter instead of shipping containers. What are box culverts, how do they differ from shipping containers, and what do you need to know about using one as a fallout shelter? Let’s explore these great questions. Box culverts are concrete tunnels that are buried under roads. They are designed to be concealed and are very customizable. 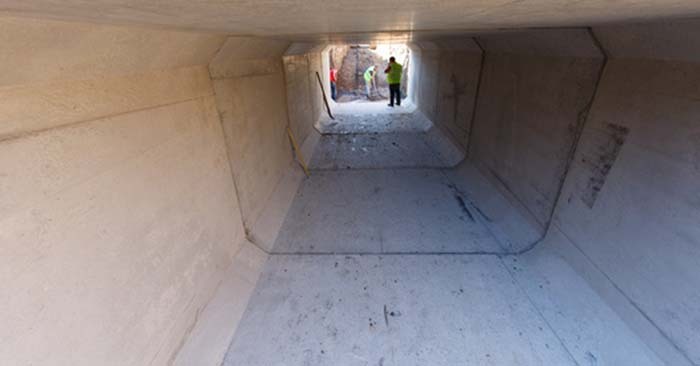 There are companies that can make these culverts to size and your specifications. This is a method that is rarely talked about in the survival world, but it can be very useful. You see, there are all sorts of shapes and sizes that you can get these culverts built to. This is the main perk of box culverts. They will work with all sorts of specs. It’s a far superior method to the simple rectangular cube of a shipping container. Also, those shipping containers will have to be reinforced and you can see why in the link above. Think of how beneficial it will be to get a culvert cut specifically to your needs? You can’t do that with a one-size-fits-all shipping container. You can’t do that with many other options of fallout shelters. If bunker living is one of your preparedness goals, you should certainly check out the concrete culverts and their possibilities. You will be surprised when you read about the price compared to shipping containers. Who doesn’t want to save money? When it comes to emergency preparedness, there is always room to save more money when you start planning in advance. The more time you give yourself, the more you can potentially save. This is the benefit to box culverts because you can spend less and still have money for enough supplies to survive underground for at least 2-3 weeks (the minimum recommendation). You pay out of your nose for a reinforced shipping container that you hope doesn’t get rusty and leak over time. For a typical reinforced 10 foot shipping container, you could probably pay about $10,000. For the same sized customized concrete culverts, you are looking around $6-8k. This leaves you around $2-3k dollars to spend on better air filtration or food and water to stockpile in your shelter. Concrete will withstand blasts better than an old shipping container, too. People always tend to miss that point! So, you’re spending less and you’re getting more. That also gives you more funds to allot to stock up on supplies like food and water. There is a lot more great information out there on using box culverts instead of shipping containers for bunkers. If you’re looking for a cheap underground bunker, this might be the perfect option for you. Let’s explore more. When it comes to choosing an underground bunker for a fallout shelter or emergency plan, you need to understand bunker design. This will help you make sense of it all, as it pertains to your needs. In addition to the different bunker designs, there are also different culvert designs. 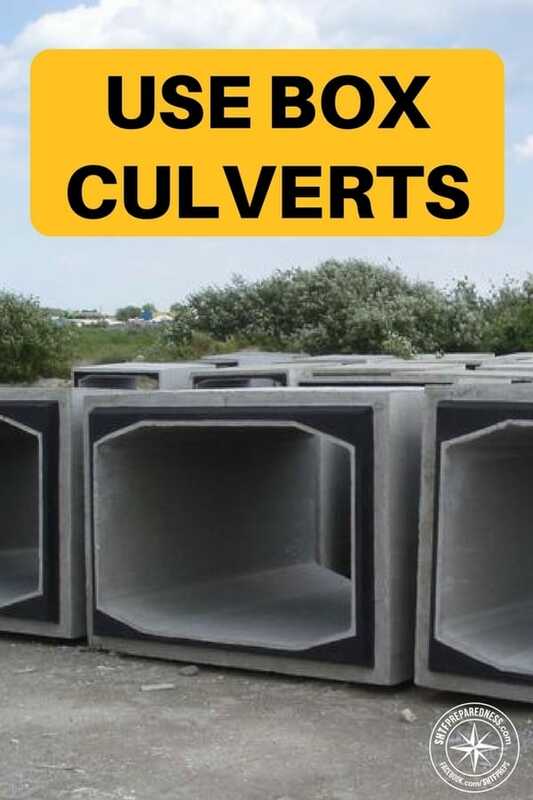 If you are looking for culverts for sale, take some to familiarize yourself with the different designs and culvert sizes. When considering bunker design, you need to think about how many people will be in this bunker and account for being in it for at least 2-3 weeks. Practical and usable space will quickly become a valuable commodity when you are stuck underground in very close quarters like that. You need this emergency shelter to be comfortable, healthy and as space efficient as possible. If something has happened to cause you to go underground, that’s going to be stressful enough. You don’t need to also worry about the lack of space. A cramped and unfriendly environment will put added stress on everyone involved. When considering sizes, you also need to consider how much headspace you will have. A box-shaped shelter will feel like you have more room than a rounded steel pipe, for example, because you will have more headspace. That can really make all the difference when you’re in the emergency shelter. You can even use a culvert sizing calculator to help you determine what will best meet your needs. If this is too complicated for you, there are experts who can help you. Don’t feel like you have to do everything yourself. 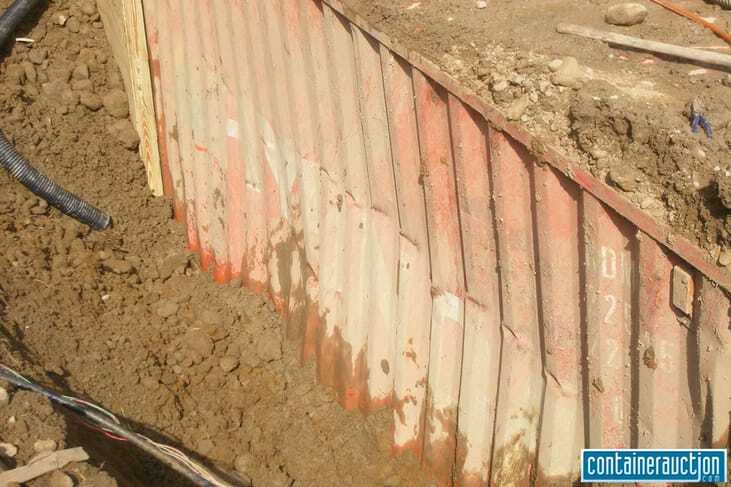 Once you’ve made the decision to use a box culvert bunker, you also need to know how to stick your survival bunker so that you can be ready for anything. When SHTF, you want to have your bunker loaded with supplies and ready for whatever happens. You can’t survive long underground without oxygen. You need a proper air ventilation system and enough oxygen to last for all of the people who will be in the space. Fresh or purified water is going to be one of the most important resources you will have. It’s more essential to survival than food. You need water – and plenty of it! Food is important after water and you need non-perishable food. Canned foods, MREs, crackers, etc. are all great choices for stocking your emergency shelter. No matter what climate you are in, it’s not warm underground so warm clothes are going to be important. Also, consider layers so people can adjust as they need for temperatures and weather. Basic first aid supplies are going to be really important. You won’t be able to go to the doctor for things during this time. You have to take care of your own injuries and prevent infections. Depending on the size of your bunker, you will want to stock up on some tools. A basic toolbox might take up too much precious space. Consider multi-purpose tools instead. This is the prepper’s dream. Batteries are your lifeline so stock up while you can. Keep loads of batteries for your flashlights, a battery-powered radio, and other essentials. You may also need to have important documents here like photo identification for everyone in the shelter. If everything above ground was destroyed, you wouldn’t want to lose these documents. A good alternative to burying a shipping container underground, and risking the walls caving in around you, is a shipping container home (or storm shelter). There are some pros and cons to building your home using shipping containers. Cost: The major consideration is cost. Building a home yourself using shipping containers can be considerably cheaper than traditional building methods. There are some trade-offs, of course, but if your primary concern is price then this may be a great alternative for you. Build Time: If you need something fast, shipping containers have one distinct advantage. They already have a floor, walls and a ceiling in place! I’d say that will cut a significant portion of your build time. Experience: There are not a lot of people or contractors that have experience with building container homes. That’s why finding DIY shipping container plans is so important. Building Permits: Yes, you will still need a permit! However, permits are not unique to container homes, they will apply to a traditional home as well. You will need to follow your local laws and regulations. So while the process may be frustrating at times, it’s a necessary evil. Now that you know how to choose a box culvert bunker and what to put into it, you can begin your prepping and planning. Can you see now how this is a better choice than shipping containers? How will you get started in prepping a fallout bunker for yourself?